Whether you are coming to this site for the health, for the taste, or just for the experience, you will get the best experience by just diving in. Don’t just do it for a meal, to it for a week, or a month. Why? Two main reasons, one emotional and one practical. Emotionally and physically you’ll feel great. We’ve invited many people over to our house to eat our Korean food with us–good food is always made better by eating it slowly with good people–everyone comments on the food in one way or the other. Almost all of them mention, above all else, that they had a very tasty meal, were full and satisfied, but did not feel heavy. You won’t feel that stuffed feeling you get from over eating foods with a lot of cheese, oils, and fat. You will feel great about eating all week or month, whichever your choose. Practically, there are a lot of dishes that are part of one Korean meal. If you were to sit down and make all the dishes for one meal, it would take all day. But they are not designed like that. They are designed to last a long time in the refrigerator. Let’s take a look. This is an example of a fairly large Korean meal, perhaps for four people. There are many more lavish examples to be found in more expensive establishments or higher class homes, but this is still a bit extensive. This is a much more realistic meal. For example, if you were to invite people over to your house for dinner, or if you went to a medium class restaurant. To be honest, my meals at home look a little more like this. Sometimes a little more, sometimes a little less. There’s no need to get overwhelmed. Let me break down the parts of the meal that you see above. Let’s define terms. Banchan (Side-dishes) – 반찬 – The little bowls. These are there to compliment the flavor and to be eaten with rice or the main dish. However you please. Because they are mainly eaten with plain white rice, they are a bit salty or otherwise strong flavored and therefore not usually eaten alone. Think of eating them much like you would a very garlicy piece of garlic bread with pasta. Alone, the garlic bread may be strong, but with the pasta and the tomato sauce, it’s amazing and perfect. That’s the concept. The most common banchan is, you guessed it, Kim-Chi. Every meal in Korea has it. But, if you don’t like it, there is no obligation to have it on your table, there are plenty more to choose from. Guk (Soup) / Tang (More fancy main dish soup) / Jjigae (Stew) – 국 / 탕 / 찌개 – The bigger bowls. In the second picture above is the closest big bowl, in the last picture it’s the black stone bowl. Guk‘s are thinner, Tang‘s have a little more substance or complexity to them, and Jjigae’s are a really hearty stew. Myeon / Guksu (Noodle dishes) – 면 / 국수 – These words don’t describe different categories of noodles, just the word origin. Myeon is from Chinese and Guksu is an original Korean word. These dishes can range from simple ramyeon (look familiar? It’s very similar to the common-in-American-college-dormitory Japanese ramen), to complex noodle dishes served with or without soup, and cold or hot. There are a a lot. Bap (Rice) – 밥- There are so many different kinds. Start with sushi rice that can be found in any grocery store. That the basic. Want to try something new? Try the purple rice seen in the second picture above. Let’s describe a common Korean meal. Each Korean meal consists of, and I purposely say this in the most vague terms possible, a bowl of rice, a few banchan, a soup of some sort, and maybe a main dish. How many banchan should I eat? Do it as you wish. Look above. Do you have a big stew or another main dish? If so, maybe just two of three. Maybe all you have is rice, eat it with a few more banchan. What do you mean by a main dish? Something not banchan. Maybe it’s a stew, or a big soup, or some meat dish, or a noodle dish. Can a left over noodle dish be a banchan? Can I eat a meat dish and a noodle dish together? Can I put my banchan on my meat? Can it….? YES! YES! YES! And you’re probably eating it the way someone would in Korea as well. The Korean cuisine is all about many different types of flavor mixing in your mouth. The oft heard motherly adage “don’t stuff your face” or “finish one bite before eating another” or even “eat with your mouth closed” doesn’t really apply with Korean food. Take a bite of rice. Then eat some banchan. Then a spoonful of soup. Mix it around. Enjoy the flavor. Enjoy the experience. Korean people are very proud of their food, they are zealous about taste, and they like to share good food with good people. First step, go to a Korean restaurant. Don’t just go there and try some food, tell them you are learning to cook Korean, that you want to eat Korean at home every day, and that you want to try as many different dishes as possible. My guess, 9 times out of 10, you will have lots of smiles, lots of explanations, and more food than you can eat. Take a notebook and write it down. Ask what it is called. Ask what is in it. If you have a Korean friend, tell him/her the same thing, chances are it will warrant a trip to his/her house to get a home cooked meal. Home-cooked is always better tasting. Take up the chance and enjoy. Once you have a feel for Korean taste and food lets get started. If you want to really try a tasty, healthy, happy lifestyle, take the challenge and eat Korean food three meals a day. On the weekend, take a break if you want and eat whatever you like, if you are like me, slowly you’ll find yourself loosing a desire for salty and fatty foods because your taste buds will be changing. Okay. Breakfast. It’s mainly the same. Although there is one food I can think of that is a Korean breakfast food (Juk / 죽), there is really no differentiation between the content of the meals, except perhaps in the mornings you are more likely to eat just some banchan and left over soup than you are to cook up a main dish and have a feast. To get started we need some banchan. There are two different types of banchan: meet-banchan (밑반찬) and jeuk-seok banchan (즉석반찬). Meet-banchan is long-term banchan. It can stay in your fridge for weeks, maybe almost two or three months. Jeuk-seok literally means “on-the-spot” or “impromptu,” carrying the implication that these side dishes were made just for one or two meals. They are almost like semi-dishes. Maybe you keep these for a week at the most. Start with three or four. Some weekend, when you have some time, make a few. For a variety of flavors here is a suggestion of some basic banchan: pickled onions or peppers, kimchi, seasoned pickles, oo-eong (simmered burdock root). You can look around the recipe page to find may others. Start with maybe three banchan; then, as you have time, make some more. If you make two each weekend, you with keep replenishing your supply and give yourself variety. You want enough so you don’t have to eat the same thing every day. Once you have this you have your basic Korean meal. IMPORTANT WARNING – The meet-banchan is designed to be kept for a long period of time without going bad. Many of them are spiced and/or pickled to help with this by means of natural preservative. But, if you get contaminate the container with saliva from a used spoon, a misplaced cough, or an unsealed container you will greatly reduce the life expectancy. For example, some of the best kim-chi is two or three years old, yet I once had some go bad in less than a month because I ate from the container. Always have one container for storage, and one for eating, and don’t reuse spoons without washing. HINT – Kim-chi is one of the most popular side dishes, and yet it is very complicated and time-consuming to make. You can buy it as the store, but it will not be close to as tasty as home-made. Since I would not recommend trying to make it right away, try to find some homemade. Go to a Korean restaurant and tell them your story. Try to buy their kim-chi, they most likely make it themselves. Best case scenario they give you a free bottle, worst case they’ll tell you the best place you can get it. My favorite in this category is doenjang soup. It’s easy, and it complements the Korean flavor so well. Actually, you can use the soup similarly to the banchan, by keeping it and reusing it for a week, and people often do. In fact, Korean soup often taste better on the third of fourth day. See the hint below. Koreans often do not drink water or juice with their meals, instead they use the broth from the soup or stew for their thirst. It’s more tasty than water anyway. On the first day, use the soup as a main dish and serve it in a big, main-dish-ish container, but make a lot; after that, serve it in a small bowl just to compliment the meal. HINT – After eating the soup in the first day, put a lid on it and leave it out overnight. Remember, the fridge is often the enemy of good flavor. The next day, before you eat it, just bring it to a boil to kill any bacteria that may have developed overnight. Then eat it again. You’ll find it tastier the second day. However, after day two, you should probably put in it the fridge for safety. I wouldn’t eat soup that’s been left after, even it boiled, after day 3. This is especially true with soup where you use any type of seafood or meat product. Cook a little. This is the same as any other cuisine. Find a recipe and make it. I’ll put some on here overtime, but there are a lot of Korean recipe websites out there. Trust the ones that suggest you use authentic ingredients over generic ones for the best taste. Got left overs? Today’s food is tomorrow’s banchan. Perhaps there is a side dish that you think goes really well with your main dish. Make it. A full meal often included both long-term, and short-term banchan. Eat happy and eat healthy. Remember, the best food is savored and enjoyed by eating slow and eating with friends. Turn off the TV and create some close bonds with your fellow humans. Korean dishes, especially the meat dishes, go very well with beer, wine, or clear vodka type liquors. Don’t over do it, but remember that your calorie count is much lower eating Korean food, don’t feel guilty having a glass of beer with dinner. Don’t underestimate the power of presentation value, even at home, even if just for you. You will enjoy your food more if you take the time to present it to yourself and others in the best possible way. 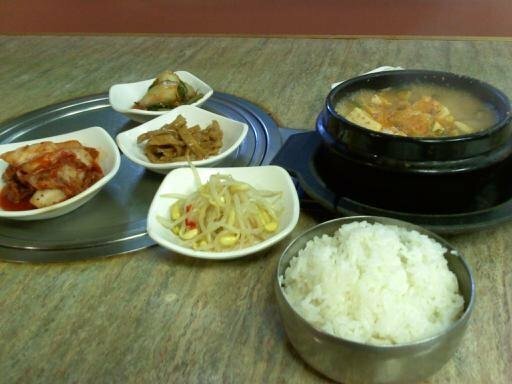 Search Google images to verify this if you would like, Korean meals almost always are bursting with aesthetic value. Enjoy a culture where good flavor is not mainly derived from dairy products, fried oils, and meat. It’s much healthier. But beware of your salt intake. The Korean palette is very sensitive to salt, so Koreans very naturally self-moderate consumption of the oft-salty banchan. The typical American has a much higher ability to eat a lot of salt and not notice it. The side-dishes and soup are often salty, that is why they are eaten with a lot of rice. Follow the example, just be conscience of salt intake. Have fun! It’s your experiment! Make it yours. I am making a big banchan meal of 22 different side dishes, including two desserts and the main course of bulgogi (so technically it is ‘only’ 19 side dishes (hah) but this happens every time I do a Korean dining experience…I get carried away. I have a few concerns about my timing–most of these dishes will need to be made one to two days before the big banchan bash, and will need to be kept in the fridge. Ordinarily I would do all the night before and the day of, but its not practical. Plainly the ‘meet’ dishes like pickled radishes, kim chee of various sorts will be fine. I’m more concerned about the texture of the dishes on the day of serving. I’ve instructed my wife to bring out all the dishes from the fridge to room temperature a couple of hours before the dinner. I think these may be ok, but not sure. As I tour South America this month, just the sound of your ambitious meal makes me jealous for some homecooked Korean food. Good luck! That is a lot of dishes. Besides thinking that you may be crazy for such an undertaking, 🙂 here are my thought on the side dishes. First, when I am planning on using the pickled dishes, a few days is always good to let the flavors set. (I would suggest more than a week for the diakon kim chi). The “same day” policy would be similar for the sauteed zucchini. The rest seem fine to do a couple of days before. The room temperature idea is a good one. One last note, deonjang beats out miso any day for the Korean meal experience, especially it you are interested in texture. All the best, let me know how it goes. Wow, thanks for the prompt reply! I will follow your advice about the scallion pancakes (pajeon) and make them the day of, though I went ahead already with the zucchini banchan, alas, so it won’t be at its best. No help for it. Your advice has been very helpful and timely. Much appreciated! Enjoy South America! Yeah, I kept adding new ones. Right now I’m doing the Shishito peppers dusted in mochiko flour and with the sauce. Once done, into the fridge!